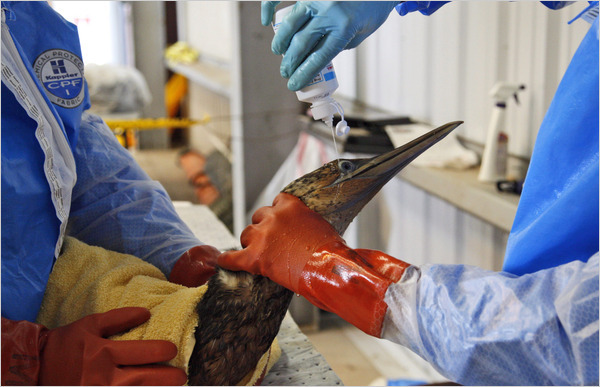 treated an oil-covered Northern Gannet on Friday in Fort Jackson, La. inadequate to stop what is unfolding into an environmental catastrophe. said was possible earlier in the week. are missing and presumed dead. increased fivefold to 5,000 barrels a day. equipment that might be helpful. disperse the oil while it is still in the Gulf. though they cautioned it was not a guarantee. that the oil would never reach the coast. think we need to do more' or 'That's adequate,' " he said. it would bring in any more resources," he said. result from the Deep Horizon rig. everything we have at it." oil reaches land, had already been mobilizing for a far larger spill. stopped before it reached the coastline. made more complicated tactics like controlled burns impossible. leak was 5,000 barrels a day, the response would have been the same. we have been working this very hard," he said. ones who were sent by helicopter for emergency care. for 30 years," Admiral Allen said. Leslie Kaufman from New Orleans.